People have a funny way of remembering the past. Huge events that shape the future are often forgotten and the most trivial of things made memorable. And unlike Caesar, the good often lives on while the bad is buried in the history books. For instance, if you were to ask the man on the street what happened in 1927 (and discounting the answers “I don’t know”, “the Japanese bombed Pearl Harbor” and “the Civil War Ended”) you’d probably get something about Lindbergh flying solo to Paris, Prohibition, and The Roaring Twenties. Sharp Movie Habit readers might even know that the film The Jazz Singer premiered and talking movies were born. But who today knows that the biggest single natural disaster to strike the United States — certainly the largest flood — happened in May of 1927? It’s instructive to compare two notable events from that year: Lindbergh’s flight and the great flood of the Mississippi River. One man makes headline history and one disaster is forgotten with turn the of a newspaper page. Lucky Lindy completed his solo flight to Paris two weeks after the Mississippi flood waters crested. Why does a stunt by an unknown airmail carrier become such a big story? Perhaps it came so close on the heels of so much bad news and the public just wanted a bit of good news for a change. Even 40 years later, Jimmy Stewart doesn’t star in a film about the Great Flood of 1927, he plays Lindbergh in The Spirit of St. Louis. You do the math. Now along comes filmmaker Bill Morrison and musician Bill Frisell with The Great Flood, a performance-piece-as-film about the 1927 Mississippi flood, available on DVD from Icarus Films. Morrison is the guy who brought us Decasia: The State of Decay in 2002, a brilliant repurposing of damaged film. But this time the sensibility is on the content of the film not its condition. Yes there is a bit of scratchy and damaged film, but most of The Great Flood is amazing in its clarity. And because we have a great subject, there is a great blues score written by Bill Frisell. The Great Flood seems to be a documentary yet it’s not your average doc — there’s no grave commentary by a profound narrator. The downside is that there is no explanation of what you are seeing apart from the barest copy and section titles. Apparently you are expected to do the historical spade-work yourself... and maybe that’s a good thing. Icarus Films provides a good starting point with the notes included in their DVD. The Great Flood opens with a computer graphic “fly-over” of a map showing how huge the flooded area was. That transitions into actual aerial footage of the flood itself. Filming the flooded terrain from the air would have been quite a novelty in 1927. That along with the many cars and trucks appearing in the old footage, makes this a true Machine Age 20th century disaster. A key feature of the 20s was that, after World War One, everything was new, modern, mechanical and fast. While we are used to seeing the evening news covered by aerial cameras, in 1927, it would have been breathtaking and right in step with the times. It really was The Jazz Age. And things actually were pretty good in 1927, unless you were a sharecropper scratching out a living along the Mississippi River, and then life was still essentially Piers Plowman. Then when the flood hit, life just got worse for the farmers. To me, the sharecroppers’ footage seemed a dress rehearsal for the Dust Bowl documentary The Plow That Broke The Plains (1936). I have to wonder if there is a connection between the footage shot in 1927 and 1936. In contrast to the sharecropper’s life, Morrison puts in an animated review of the 1927 Sears and Roebuck catalog. Is this done to acquaint the viewer with the styles of the day? Or perhaps it is an inventory of new and modern material possessions one could have lost in the flood...? Lost that is if you had the money to buy any of it. The footage of the flood itself is pretty much what a flood looks like. Modern viewers will think of Hurricane Katrina but this flood was much bigger and had social and political repercussions that were also greater. One of the points made in the notes and on the screen is the devastation to the black community along the path of the flood. After the flood, tens of thousands of black families were left with nothing of their old lives — less than nothing if you think of the black men who were pressed into service to shore up levies protecting white properties while their own land flooded. Betrayed during and after the flood by the white politicians, thousands of black families turned their backs on the South and migrated north to cities like Chicago. The racism there was as bad as the South’s... in some ways worse... but they were done with the South and sharecropping along the Mississippi River. Although Herbert Hoover is shown leading the charge for the government’s response, you will have to look elsewhere to find out that many blacks not only moved away from the South, but away from the Republican Party as well. Today it’s strange to think that, for all the years after the Civil War, the GOP — the party of Lincoln — was the political home of black America. In 1928 only one more Republican would be elected president and then the White House is Democratic until 1952. Yet another bit of fallout from the 1927 flood? The Great Flood concludes with scenes of (possibly) transplanted black survivors exiting a church in Illinois. It is after the flood but before the Great Depression and they look prosperous in their new home. There is even later footage (it looked to me to be in the late 1950’s or early 1960’s) of black musicians playing while others earnestly listen on and dance to the music. The point here is that popular music, especially after World War Two, is the child of the great black migration to the North. This is a reasonable assumption when you think of music like Chicago Blues and the Motown sound. And so we come full circle with Bill Frisell’s score... Well done! 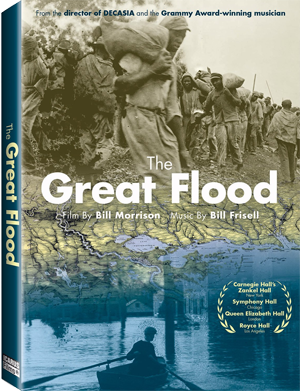 The Great Flood is a solid if untraditional historical documentary and it must be a treat to see performed with live musical accompaniment (The DVD version was recorded at a performance at the Moore Theater in Seattle, WA in 2013 with Bill Frisell on guitar). It is more accessible than Decasia, so any viewers who might have been scared away should give The Great Flood a chance. And fans of Morrison’s style (myself included) will find this a satisfying experience, though less avant-garde than Decasia. And one more thing, in December of 1927 Showboat debuted on Broadway. Embedded in that mostly-average musical is its heart-and-soul classic tune, Old Man River, which, like its namesake, has just kept rolling along. Old Man River is the only tune used in The Great Flood not written by Frisell. And really, could they have made this film without it?